QUESTIONER: Good morning. My question was partially already answered. It was about Spain. During the Spring Meetings it was said that Spain had decoupled from the other economies in risk like Ireland, Portugal and Greece and I wanted to know your opinion about the risk of contagion to Spain right now. The second question is related to the euro. Why do you think the euro has been standing so well despite the very bad economic situation in Europe? Thank you. MR. EVERAERT: On Spain I’d like to defer you to I think there is going to be a Board discussion on Spain in the next few days and all the details there about our view on Spain will be given. On the euro, I think that one shouldn’t forget that if you look at the numbers, 90 percent or 85 percent of the Euro Area is doing pretty well. In fact, growth in Germany has never been as high as it has been this year. It’s above 3 percent and was so also last year. So I think that if we can contain the crisis to the periphery, we shouldn’t be worried about the rest of the Euro Area. Thank you. This is a good opportunity to look at some numbers. 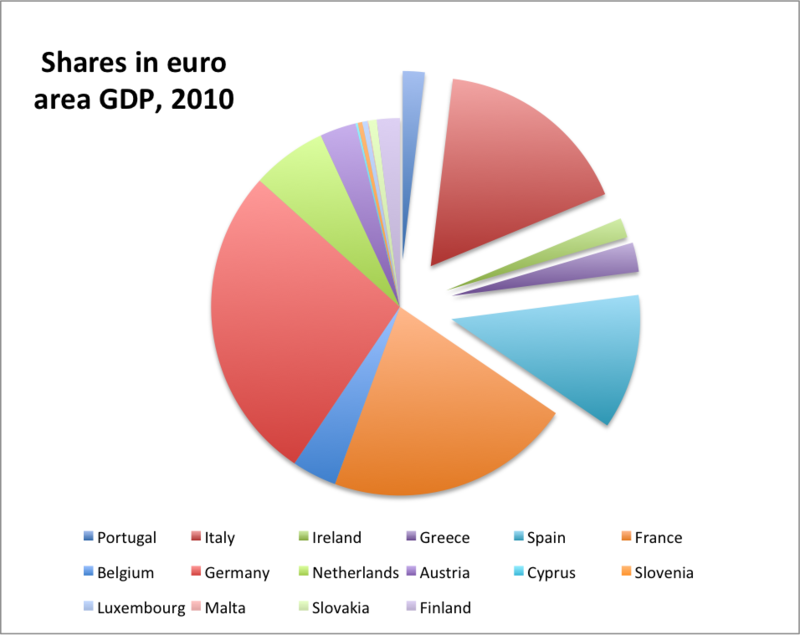 Here is the share of euro area members in euro area GDP in 2010. PIIGS are the slices I moved a bit, ordered along the PIIGS moniker with Portugal on top. Just so that you know: their share in euro area GDP is a little bit more than a third! More than double of what the IMF spokesperson thinks it is. Do they have a clue? Do they understand that German exports only promote growth because these countries (PIIGS) go further into debt? Do they understand that Germany grows so quickly because the crisis hit so hard there?